Proud to say that GlobeSt wanted to interview me to discuss the dynamic, rapid rent growth Westside office market, due to my experiences helping companies navigate it every single day. Economics have skyrocketed along with demand over the past 5 years but with the right targeted approach, any company can solve for their optimal solution. Hope it helps and always happy to discuss further if interested! LOS ANGELES—The Westside office markets are becoming more and more competitive, but for tech and entertainment users, they are prime stomping ground for business. In fact, the tech and entertainment markets are driving the office sector in the Westside markets, which have continued to see phenomenal rent growth over the past four years. To find out where rents are heading (hint: up) and how tenants are faring in these markets, we sat down with Avison Young tenant representation specialist Jeff Vertun for an exclusive interview. GlobeSt.com: Can you give me a big picture overview on the tech and entertainment industry in LA right now? Jeff Vertun: Both the tech and entertainment industries are experiencing tremendous success and growth. They are two major industry drivers for Los Angeles’ overall economy and particularly within the Westside markets. Funding of LA tech companies has continued to increase, while we are also starting to see more external investment from areas such as Silicon Valley that are helping drive the necessary later stage, larger funding rounds, providing further growth capital. The entertainment industry is also growing and it seems as though there is an unquenchable consumer thirst for content of all sorts (e.g. YouTube videos, web series, Instagram models, reality shows and so on.) Content creators and synergistic businesses that support them are growing and creating a fantastic ecosystem. We are also seeing a continued marriage of entertainment and tech here – which is an industry in its own right. GlobeSt.com: As these companies grow, job growth continues and subsequently, demand for quality creative office space has caused rents to skyrocket. With Westside being such a hot market, can you paint a picture of the rent growth in recent years? 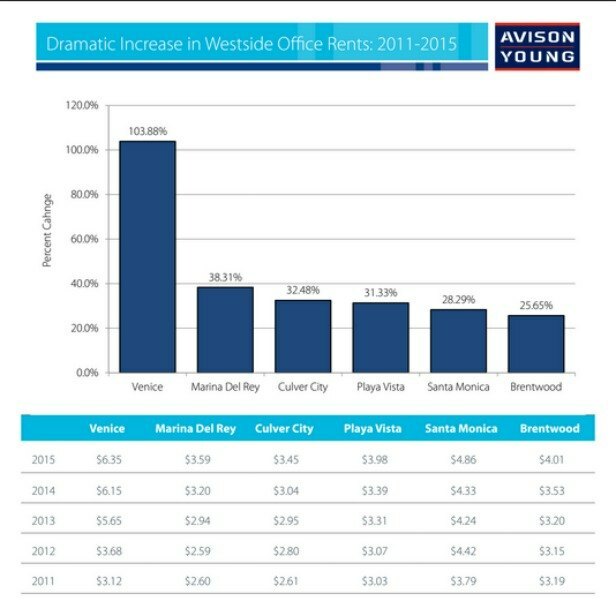 Vertun: There has been a dramatic increase in Westside rents over the past four years. Venice has seen the strongest increase of 103% from 2011 through the end of 2015. Other Westside submarkets have ranged from 38% to 25% growth over the same time frame. Since demand has consistently outweighed existing and new development of creative office space, we are seeing a growing interest in previously less popular submarkets such as southwest Culver City (right off the 90 Freeway and Slauson), El Segundo, and the Olympic Corridor (now being called the New Media District) due to more affordable rents and availability of office space. This chart illustrates the rent growth Vertun cites in his response. GlobeSt.com: How are you advising your clients when it comes to negotiating space in this market? Vertun: Every company I work with has unique needs and it is a very individualized process that ultimately results in long-term cost savings, a good fit for the company culture, better attraction and retention rate for employees and optimum business growth. It is important to educate users on what is currently happening in the market and help them make decisions based on their particular needs and projected business plan. And, it is critical to customize a real estate strategy to align with that plan. Off-market opportunities are something I manage on a regular basis and result from being entrenched in the tech and entertainment industry here. GlobeSt.com: Are landlords becoming more flexible for growing firms? Why or why not? Vertun: Flexibility is a common theme for most rapidly growing companies. Strategies include finding on and off-market subleases, quick second generation spaces, negotiating early termination, expansion, or contraction rights, or simply moving fast and clean enough that the landlords are okay with shorter terms. Relationships definitely help get these deals across the finish line. A good case study example on creating flexibility was with a client of ours, Scopely, a mobile gaming company. The company was eventually going to need 30,000 square feet of space, but didn’t need it immediately. Our team subleased the un-needed portion of the space in Culver City to another client Omaze, a smaller, but growing tech firm for a short period of time. Omaze would ultimately grow out of that space just in time for Scopely to grow into it. When things come together like that, clients recognize the value in street-level market knowledge.